This is an alternative to the North Borneo – Sukau & Danum Valley programme ( tour code BKI6Dan). The price difference is because is due to the higher prices being charge for the Danum Valley package. However, Tabin Wildlife is a still great place to spot wildlife & birds. Depart Kota Kinabalu by flight MH 2042 (0700/0740) to Sandakan.Arrive Sandakan airport, meet & transfer to the world’s largest – Sepilok Orang Utan Rehabilitation Centre. The orphaned orang utans from logging sites, plantations and illegal hunting are rehabilitated before being released into the wild. See the primates being fed by the park wardens plus a video show. After lunch, transfer by boat to Sukau Village. In the late afternoon, take a two-hour river cruise to see the Proboscis monkeys as they settle down on treetops along the tributary of Kinabatangan River. Evening dinner & overnight at Lodge. After breakfast, transfer by 2hrs overland to Lahad Datu and follow by another 1hrs to Tabin Wildlife Reserve on gravel road. 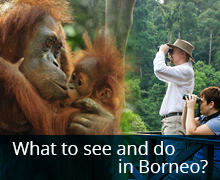 Journey to this largest wildlife reserve in Malaysia takes about 1 hour. Upon arrival, register and check into the charming Borneon timber bungalow of Tabin Wildlife Resort which comes complete with private balcony, air-condition and hot water shower, a real luxury within the jungle. Enjoy the splendour of mother- nature and explore the vicinity of the resort. Built alongside the Lipad River and nestled within the rainforest, a variety of birds, insects and even small mammals can be sighted quite easily within the resort. Discover the rich variety of jungle herbs, some endemic, used for generations by local folks for the treatment of various ailments. In the afternoon, visit the Lipad mud volcano which provides a mineral salt lick for wildlife. After trekking through the rainforest for 20 minutes, arrive at the elevated bare area of the mud volcano which is frequented by wildlife and birds. Try to identify the multitude of animal footprints here. Climb the observation tower and admire the contrasting landscape of the bare mud volcano and its surrounding thick forest, where birds are commonly sighted. After dinner, enjoy a slide presentation on Tabin’s natural wonders, followed by a trip to look out for nocturnal wildlife and birds. Remember to look up at the clear, dark sky of Tabin, identify the constellations above you and make a wish or two. You may opt to join the early morning bird walk to discover some of Tabin’s rich collection of almost 300 bird species. After breakfast, trek through the lush green rainforest known for its rich diversity of plants and animal species to visit Lipad Waterfall. Take a dip in the natural pool and enjoy a natural and refreshing shower under the waterfall. Alternatively explore the surrounding vegetation or just relax. In the afternoon you may wish to try out the Tabin Rainforest Foot Soak made with a natural blend of herbs, to relax tired muscles after long jungle treks. After breakfast, stroll to the nearby rock pool or river side where groups of macaques and other small mammals can sometimes be seen. Choose to take a dip in the river or simply listen to the sound of nature before saying good bye to Tabin via scheduled return transfer at 2.30 PM, an overland journey to the Lahad Datu Airport for departure flight to Kota Kinabalu via MH 3023 (1725/1820). Note : This tour can be extended to Sipadan for Scuba Diving or just snorkeling & swimming. 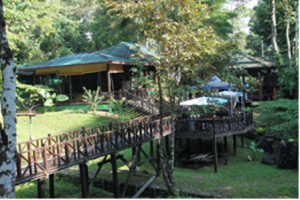 Remarks :- Thsi package can be ectended or alternate with the 3D2N Danum Valley package. To complete the Big 5 in Sabah, Scuba Diving around Sipadan Island can added on easily. Contact us for details.